From 1866 until 1993 James Smith and the company that grew from his original drapery business were a major part of the Wellington retail sector. This building was constructed in 1907 and the firm had architects King & Dawson modernise the façade in 1932 and design an extension along Manners Street in 1934. Further extensions was also added in Cuba Street in the 1960s. 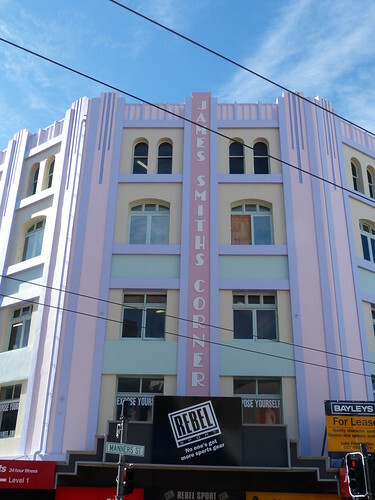 Ten year's after the store closed, the building is still used for retail purposes and the corner still bears the James Smith name. Ah, I did some serious google research on Cuba Street recently. The building reinforces why I did so. Are you off to Wellington? Cuba Street is the place to go for a good selection of bars and restaurants and its not too far from the Te Papa museum which is a must see. 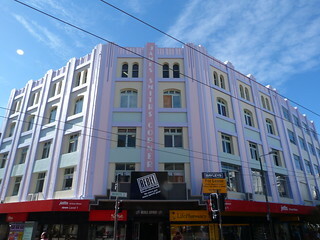 There is also The Vic which is another great deco building in Cuba St.